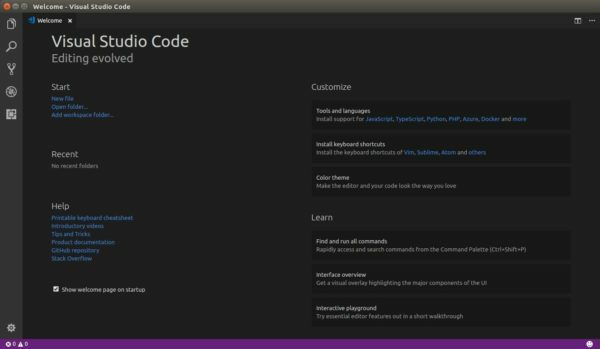 A new update of the Visual Studio Code IDE was released. Here’s how to install it in Ubuntu. New Notifications UI to easily manage and review VS Code notifications. Integrated Terminal splitting allows to work with multiple open terminals at once. Centered editor layout that maximize your code viewing screen real estate. Drag & drop, copy & paste across open VS Code windows. HTML path completion – IntelliSense for file paths in common HTML elements. Language Packs in the Marketplace – Install new display languages from the Marketplace. Deploy Azure Functions tutorial – Learn how to create and deploy serverless Azure Functions. PREVIEW: Horizontal search results – You can now view search results in a horizontal panel.